Cassia County is a county in the U.S. state of Idaho. As of the 2010 Census the county had a population of 22,952. The county seat and largest city is Burley. The first Europeans explored the Milner area in Cassia County in 1911. (1811) It was trappers who initially developed the Oregon Trail, which ran on the county's northern border. The Raft River's junction with the Oregon Trail marked the split for the California Trail. While the Oregon and California trails brought hundreds of thousands of emigrants through Cassia County, it also brought settlers. A stage line through the county was established between Kelton, Utah and Boise, Idaho in 1869. A stage station existed at City of Rocks. Additional stations were spaced at increments of 10–12 miles between stations to include one at Oakley Meadows, in the Goose Creek valley two miles west of the present settlement of Oakley. William Oakley settled at the Oakley Meadows station in 1870. Cattle operations also developed starting in 1872. Settlement began at nearby Albion in 1873 with significant Mormon settlement in 1875. By 1880, Albion had a population of 257. Mormon settlement at Oakley also began on June 1, 1878 when four Mormon men each staked out 160 acres for their settlement. Settlements remained primarily agricultural with more than 38,000 head of cattle in the area by 1885. Settlement at Malta occurred prior to 1890, as the Malta precinct had 172 residents at the 1890 census. Albion State Normal School was established at Albion in 1893. 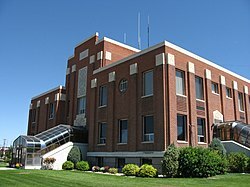 The school was focused on training Idaho teachers until 1951 when its programs were transferred to Idaho State College (now Idaho State University) in Pocatello. Burley was platted and settled in 1905 after a branch of the Oregon Shortline was constructed through the town. Declo was settled under the name of Marshfield by 1909. Cassia County was created from Owyhee County on February 20, 1879 with Albion becoming the county seat. A western portion became Twin Falls County in 1907. The county assumed its present boundaries when an eastern portion became Power County on January 30, 1913. The county seat was moved to Burley in 1918. The county was named for Cassia Creek, which in turn was named either for John Cazier, a member of the Mormon Battalion and an emigrant train captain, or for a plant found in the area. Similar to other Idaho counties, an elected three-member county commission heads the county government. Other elected officials include clerk, treasurer, sheriff, assessor, coroner, and prosecutor. Cassia County is in Idaho's 2nd congressional district and represented by Congressman Mike Simpson. At the state level, Cassia County is in Legislative District 27, represented by Senator Kelly Anthon of Declo, Speaker Scott Bedke of Oakley and Fred Wood of Burley. At every level Cassia County is a Republican Party stronghold. All county-level offices are held by Republicans and have been for decades. Republican primaries are tantamount to election to office as Democrats rarely field challenges for county or state legislative office. Cassia County is one of the most consistently Republican counties in the state and in the gubernatorial election of 2010 Republican Butch Otter carried Cassia County with 76.54% to Democrat Kieth Allred's 16.73%. In the presidential election of 2012 Mitt Romney, whose father lived for a few years in his youth in Oakley, carried Cassia County with 85.2% while Barack Obama received 13.1%. The last Democratic presidential candidate to carry Cassia County was Franklin Roosevelt in the election of 1940 edging out Wendell Willkie by around 100 votes. State legislators from Cassia County traditionally hold their seats for long periods of time. Two of the longest serving legislators in Idaho history were from Cassia County: Vard Chatburn of Albion who served in the House of Representatives from 1957 to 1986 and Denton Darrington in the Senate who served from 1982 to 2012. Because legislators rarely lose their seats, legislators representing Cassia County are often in leadership or chair committees. Since 2012, Representative Bedke has served as Speaker of the House. Bruce Newcomb of Burley also served as Speaker from 1998 to 2006. Though born in Burley, Congressman Simpson now lives in Idaho Falls. The only other member of congress with ties to the county is Henry Dworshak who represented Idaho's 2nd congressional district and later served in the Senate. He lived in Burley and was the publisher of the Burley Bulletin. A Burley elementary school is named after him. According to the U.S. Census Bureau, the county has a total area of 2,580 square miles (6,700 km2), of which 2,565 square miles (6,640 km2) is land and 15 square miles (39 km2) (0.6%) is water. The county's highest point is Cache Peak at an elevation of 10,339 feet (3,151 m) above sea level in the Albion Mountains, and the lowest is Milner Lake, a reservoir on the Snake River, at 4,134 feet (1,260 m). The northern half of the county is part of the Magic Valley region of the Snake River Plain, and numerous mountain ranges extend north from the southern boundary and diminish as they approach the river, which flows from east to west. As of the census of 2000, there were 21,416 people, 7,060 households, and 5,485 families residing in the county. The population density was 8 people per square mile (3/km²). There were 7,862 housing units at an average density of 3 per square mile (1/km²). The racial makeup of the county was 84.69% White, 0.17% Black or African American, 0.80% Native American, 0.37% Asian, 0.05% Pacific Islander, 12.06% from other races, and 1.87% from two or more races. 18.74% of the population were Hispanic or Latino of any race. 23.1% were of English, 13.8% American and 12.9% German ancestry according to Census 2000. There were 7,060 households out of which 42.40% had children under the age of 18 living with them, 65.20% were married couples living together, 8.80% had a female householder with no husband present, and 22.30% were non-families. 19.50% of all households were made up of individuals and 9.50% had someone living alone who was 65 years of age or older. The average household size was 2.99 and the average family size was 3.46. In the county, the population was spread out with 34.10% under the age of 18, 9.00% from 18 to 24, 24.50% from 25 to 44, 19.60% from 45 to 64, and 12.70% who were 65 years of age or older. The median age was 31 years. For every 100 females, there were 101.20 males. For every 100 females age 18 and over, there were 98.70 males. The median income for a household in the county was $33,322, and the median income for a family was $38,162. Males had a median income of $29,132 versus $19,851 for females. The per capita income for the county was $14,087. About 11.10% of families and 13.60% of the population were below the poverty line, including 17.60% of those under age 18 and 8.00% of those age 65 or over. As of the 2010 United States Census, there were 22,952 people, 7,666 households, and 5,758 families residing in the county. The population density was 8.9 inhabitants per square mile (3.4/km2). There were 8,372 housing units at an average density of 3.3 per square mile (1.3/km2). The racial makeup of the county was 81.8% white, 0.8% American Indian, 0.5% Asian, 0.3% black or African American, 0.1% Pacific islander, 14.2% from other races, and 2.3% from two or more races. Those of Hispanic or Latino origin made up 24.9% of the population. In terms of ancestry, 22.3% were English, 11.8% were German, 10.6% were American, and 5.1% were Irish. Of the 7,666 households, 41.9% had children under the age of 18 living with them, 60.8% were married couples living together, 9.1% had a female householder with no husband present, 24.9% were non-families, and 21.5% of all households were made up of individuals. The average household size was 2.96 and the average family size was 3.46. The median age was 32.0 years. The median income for a household in the county was $39,866 and the median income for a family was $47,995. Males had a median income of $36,402 versus $22,156 for females. The per capita income for the county was $17,782. About 12.4% of families and 15.4% of the population were below the poverty line, including 18.7% of those under age 18 and 8.1% of those age 65 or over. ^ Boothe, Wayne (1963). A History of the Latter-Day Saint Settlement of Oakley. Provo: Brigham Young University. pp. 7–8, 14–16, 22–25. Retrieved 7 February 2017. ^ Encyclopedic history of the Church of Jesus Christ of latter-day Saints. Salt Lake City: Deseret News. 1941. p. 10. Retrieved 7 February 2017. ^ Report on the Population of the United States at the Eleventh Census: 1890. Washington: Government Printing Office. 1895. p. 99. ^ "Albion State Normal School History". Albion Campus Retreat. Retrieved 7 February 2017. ^ Encyclopedic History of the Church of Jesus Christ of Latter-Day Saints. Salt Lake City: Deseret News. 1941. pp. 98, 176. Retrieved 7 February 2017. ^ "U.S. Decennial Census". United States Census Bureau. Archived from the original on April 22, 2013. Retrieved June 28, 2014. This page was last edited on 2 March 2019, at 20:51 (UTC).